Indulge yourself in this vitamin and protein rich formula. Soothe your scalp and senses while moisturizing and conditioning hair from roots to ends helping to restore shine, strength and silky softness. Place unopened tube in a cup of warm water to heat. Use before shampooing. Wet hair. Massage contents of tube into hair. Leave on up to one minute. 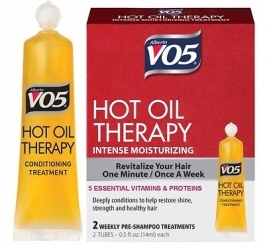 VO5 Hot Oil Therapy works best when rinsed within one minute of application. Rinse Hair, scalp and skin thoroughly. Shampoo as usual. Style. Use weekly or more often as needed.